Learn more about the projects that were selected this year and the exciting line-up of speakers, films, symposia, courses, conferences, panels and exhibitions. 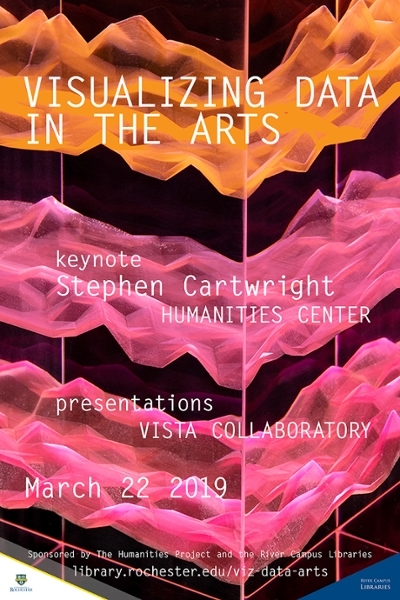 Stephen Cartwright’s work exists at the confluence of science and art, where hard data intersects with the intangible complexities of human experience. Since 1999 he has recorded his exact latitude, longitude and elevation every hour of every day. Cartwright incorporates his location data and other personally recorded information into his digital and sculptural work. In addition to his latitude and longitude recordings, recent work focuses on constructing landscapes and forms, and analyzing correlations from other self-recorded data. We don’t ordinarily think of the city of Rochester as a “prison town,” but that is a mistake. Geographically, Rochester lies at the center of the punishment regime now known to the general public as “mass incarceration.” Within 90 minutes of River Campus are 35 state prisons, federal prisons, county jails, and immigrant detention centers. Though half-hidden, these brick-and-mortar structures are but the most obvious expressions of a ruling ethos that prioritizes punishment over care, and insists on calling the brutalization of already traumatized populations “justice.” Prevailing carceral logics present an urgent problem, which impacts not only how our community keeps a great many people in cages, but also how we educate our children, care for our sick, and administer our public space, among a host of other concerns. 2018 is the bicentennial of the birth of Lewis Henry Morgan (1818-1881), a Rochester attorney and founding figure of American anthropology. In his day, Morgan was an internationally famous scientist and prominent citizen of Rochester. He remains well known in anthropology for his studies of Haudenosaunee (Iroquois) social and political organization, but his evolutionary approach to the history of human societies, an influence on Marx and Engels, has fallen into disfavor. This project aims to explore the social, spiritual, and aesthetic dimensions of the Bluebeard story and opera through a series of presentations and workshops, an exhibition, and two performances of Dukas’ opera. The project will draw scholars from various departments and disciplines to discuss and analyze Ariane and Bluebeard from multiple perspectives, including religion and philosophy, literature, the visual arts, music, and women and gender studies. In addition, we have planned several workshops on using digital technology for creating multi-media projects, including documentaries on social issues, with a step by step guide to how we put together and promote our shows, and some lessons that we have learned about collaborating with other artists. We have also planned an exhibition on the River Campus, consisting of various book illustrations of the Bluebeard fairy tale over the centuries, including more recent work by the comic book artist P. Craig Russell, whose graphic novel of the opera Ariane and Blue Beard will serve as the backdrop for two performances of the opera by TableTopOpera. The starting point of this workshop is texts: texts in written, spoken, and visual forms such as vernacular liturgical manuals, folklore, stelae, and rock reliefs. It aims at exploring Chinese religious beliefs and practices from the perspective of popular religion. Discussions on institutional religions are not excluded since they arguably wield influence on popular religion and vice versa. While the workshop will give the methodological priority to texts, our focus is not the intellectual “metadiscourses” but an apprehension of ordinary practitioners’ beliefs and practices. In his 2018 speech accepting the Brazil Academy of Letter’s most prestigious Machado de Assis Prize, João José Reis, reflected that “Slavery left indelible marks upon the society born from its foundations and still haunts us with a variety of ghosts ­–social and racial inequalities, systemic racism, episodic racism, now all the more rabid thanks to the anonymity of the Internet…the principal vehicle nowadays for preaching hate of all kinds, including racial hatred.” Reis, a preeminent scholar of Brazilian slavery in the nineteenth century, was reflecting on slavery’s enduring impact in Brazil, but his observation is just as applicable to the United States, Cuba and other countries involved in the Trans-Atlantic slave trade. Love in a Village became the first full-length opera to mirror the middle-class sensibilities of a public responsible for the rise of the novel under Richardson, Fielding, and Smollett. Neglected for nearly the past century, in spite of commemorations of Arne’s death (1978) and birth (2010), the unique surviving manuscript full score was finally edited, and published, by Artaria in New Zealand in 2011; yet no one has accepted the implicit invitation (or challenge) to perform from this edition. Moreover, since then, another editorial team independently pursued a similar project and soon signed a contract to publish with German publisher Bärenreiter. The performance will constitute the first-ever (post-18th-century) historically informed public revival of the complete contents of the manuscript full score, and will be framed by a student curated exhibit and a full complement of scholarly panels and discussions.